Lately, I wrote a small tool that analyzes letter frequencies of arbitrary text files. So I decided to download all RFC‘s and give the tool a try. 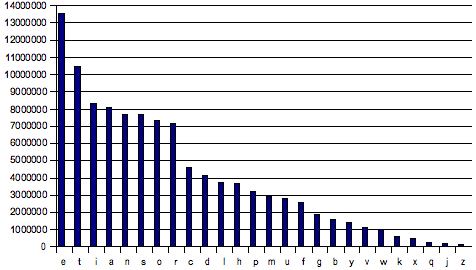 I was wondering whether the relative frequencies of letters in the RFC’s would match those shown on Wikipedia or other websites. I didn’t thought that I might come up with nice results so easily. The most frequently used characters make up the word etiansor here. If I seriously wanted to analyze the letter frequencies of a text corpus I would implement some sort of filtering. But without that I got reasonable results too.